I hear it quite often that a hunter doesn’t rattle for deer because it simply doesn’t work in their region. That’s completely false and personally I would like to see their research that they based this statement on. Rattling antlers for deer is nothing more than calling for deer and I doubt any hunter would challenge traditional forms of calling as a viable technique used in hunting. In fact if you are to bring this into technical terms rattling is a form of communication. It may not be an intended action of calling by the deer itself but it serves as communication to other deer that something is taking place that they may want to investigate or, perhaps, avoid. I will give the benefit of the doubt to those who say that rattling doesn’t work in their area simply for the fact that this is not a tactic that provides a high percentage of results. In this respect it is like calling with a grunt tube or a doe bleat. You just don’t expect that a deer will come running although you have the expectations that a nice buck or a big doe is going to appear at any moment. You need to be diligent and persistent to achieve the reaction you are seeking from the buck. Regionally speaking you hear more about rattling success in areas like Texas or large plains states. You could theorize that the plains states offer more visibility and therefore an easier affirmation that an animal reacted or responded to the rattling sequence. We could also say that the sound of the rattling would travel further in an open plains area situation thus having the ability to attract more deer as opposed to somewhere in the backwoods of Canada where the sound would be dampened by the surroundings. You also need to take into consideration the buck to doe ratio. When a buck has access to a receptive doe or group of does it’s unlikely he is going to leave these does to spend time looking for more of the same. On that same note if the ratio between does and bucks is more equally balanced the competition will be greater and the bucks will be more willing to escalate a confrontation for the limited number of breeding stock. 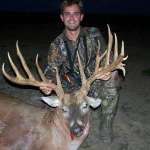 This is really an ideal situation for the hunter who plans to rattle for a buck as the percentages of success are already turning in his favor. Your choice of rattling antlers is really a personal choice. I’ve rattled bucks in with both real antlers and synthetic and also a rattling bag. Although I like the sound and the feel of the real antlers I like the ease and concealment of the rattling bag. This is especially true when the buck appears out of nowhere and the slightest move on your part might be detected. The rattling bag is small enough that you can handle it easily without creating too much of a commotion while retrieving your bow or gun. The one downside of the rattling bag is that it sometimes makes an added noise when it’s set down and the rattling sticks settle in the bag. While this can also be true of a set of rattling antlers it seldom seems like the case. Regardless of your choice they can all be effective. When I choose a spot for rattling I typically have a spot chosen where I have seen fresh signs of bucks working the area but have yet to actually see the animal. If I am hunting with a firearm I will look for an area that provides the longest line of sight and hopefully there will be some thicker timbers or swampy areas. If this timber ends or becomes fairly sparse before it reaches your location that’s all the better. Bucks that may be a little hesitant will use this cover to investigate the source of the rattling especially if it puts the wind in their favor somewhere along their travel. Now if you’ve taken note that I rattle in areas where I have seen deer sign but have not seen the animal that is because rattling is not my first choice for hunting any particular whitetail. I do prefer to go in quietly and hunt traditionally the first several days before making any additional adjustments such as calling, decoying, scent lures and attractants, or any of these combinations. When I search for an area where I will rattle while archery hunting everything is pretty much still in the same place with the exception of the need for a longer line of sight. While I would like to see a deer before it arrives into my line of sight it’s just never worked out that way yet it wasn’t a problem when the moment of truth came. My first buck was rattled in while bowhunting and using a rattling bag that I had attached to my belt. I simply reached down to my side to rattle the antlers while resting my bow on my lap. I never heard the little 6 point buck or saw his approach but like magic there he was looking around like he was lost. He stood there completely oblivious to the fact that I was already drawing my bow. A few seconds later I was able to seal the deal and began to think there was really something to this rattling deal. The one tool that helps you out in all situations can really help you along here. A pair of binoculars should be part of your every hunt but here in this situation of rattling while hunting with archery equipment, especially in a thicker forest, bucks tend to hangup just out of reach fairly often. Maybe hanging up isn’t the best description but your set of binoculars will give you a better idea of what’s really taking place. When I speak of deer hanging up just outside your hunting area I mean that the buck, or doe, has stopped. He may appear to be mulling around in the brush. He might look to be walking away or in a different direction. This can all be due to the fact that the rattling sequence has ended and the deer is left searching for a visual or scent clue as to where the sound originated. Most likely at this point the buck will realize something isn’t right. Unless you have a call like a tending grunt or a snort wheeze it’s probably game over. If you have the call now is the time to lure that buck in those extra steps that you need for a shot in your comfort zone. Now if you look into a rattling sequence you really need to understand how whitetail deer do battle. This isn’t like a couple of rams bashing head together at all. In fact the full on fights that you have seen in videos are footage of rare instances in most areas. You have to consider the escalation of the fight between two bucks and they do not have to be evenly matched. Often a smaller buck will get into a very brief tussle with a bigger buck where you would only hear a very faint clack of antlers and then it’s over. Now think of that short encounter and the volume, or lack thereof, and you have an idea of how to begin your rattling sequence. Often called tickling or sparring it involves barely touches the tips of the antlers together or some very quick rolling of the rattling sticks. Often that’s followed by a brief pause or some minimal grinding or scraping of antlers as the bucks stand together and push against one another. Often this is all a deer needs to know that he is a subordinate or dominant animal. When these brief tests of strength fail the situation can escalate quickly from here. Think in terms of a boxer that instead of throwing the little jabs he threw earlier now throws a combination while the opponent deer counters with it’s own defensive flurry. Now the pause between the clash of antlers will be shorter before the bucks go back at it again even harder this time. The point here is to create the realistic illusion of two buck’s fighting and not a banging smashing torrent of antlers that sounds like a half dozen different sized bucks trying to poke one another’s eyeballs out with their antlers. Watch some video if you can and get an idea how different deer approach the fight sequence in their own unique method and how fights break off quickly. To make the antler rattling sequence more believable you can make good use of scents and calls. As mentioned earlier a tending grunt call or a snort wheeze call will help bring some realistic aspects to the rattling and if you’re willing to take the time some appropriate scent will trigger the sense of smell which can be the last defense of a smart whitetail buck. All in all make it as real as possible. 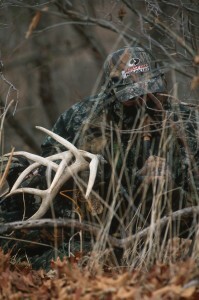 If you’re in a treestand using a set of rattling antlers rake them against any available branches during the sequence. If you’re on the ground use the heels of your feet to stomp the ground and push fresh dirt to the surface. You’re making noise for a purpose so don’t be timid about breaking a branch or crunching a few leaves that may help close the deal on that big dominant buck. Some hunters talk about the weather and it’s affect on rattling. Granted, weather can hamper the effectiveness of your rattling but it doesn’t mean it shouldn’t be performed. Deer will fight on a windy, calm, snowy, rainy, cloudy, clear, cold, or warm day. The argument is fairly mute if you disregard the obvious points of the sound traveling less distance on a windy day or that the sound gets muffled when rattling during a snowstorm. The best part of rattling for deer is of course the results and don’t expect them to be identical. Any size buck will respond to rattling and their response actions will nearly all be unique. It seems some of the biggest bucks come in with great refrain as if they understand they are the boss so there’s no hurry. Perhaps they are just that cautious but the biggest buck I have rattled in literally ran to the sound of the antlers clashing together with the fur on it’s neck all bristled and plenty of guttural sounds reverberating with his each movement. This is more typical of what I see with the smaller bucks, minus the grunting and bristled hair, as they are probably thinking they might steal a doe while the big boys are fighting. Again. I’ve seen plenty of small bucks move around like they were walking on egg shells. You really never know how they will react or if they will react at all. In the end it’s rewarding regardless if you rattle in a small buck or a true trophy. It’s just going to take a lot of patience and timing your rattling endeavors to that portion of hunting that centers around the rut when bucks are actively seeking a hot doe. And willing to fight over her.